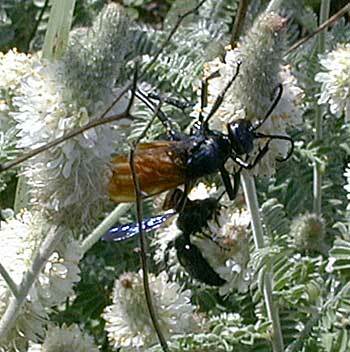 Notes: These colorful wasps, with deep blue-black bodies and bright orange wings have an "interesting" life cycle. The female wasp searches for a tarantula (or other large spider), paralyzes it with a sting at the base of the legs, hauls the victim off to a convenient hole, often the victim's own burrow, lays one egg in the body, and then seals off the burrow. When the egg hatches, the larva eats from the living spider's body until it kills it, breaking out of the burrow as the new generation in the next season. The males, meanwhile, can be seen browsing among the flowers. As an aside, the bright coloration of these wasps is an indication of the strength of theiir venom. While wasps rarely sting humans, the sting would be extremely painful.